Florian Hoffmann is the Founder of the DO School. The DO School empowers individuals and teams to learn how to turn their ideas into action, create innovation and impact that are good for themselves and society. The DO School is based in Berlin and New York. Florian was also involved in starting organizations in philanthropy, in media and in the lifestyle industry in Asia, Europe and the US. Florian holds an MPhil in International Politics from Oxford University with distinction. He also studied arts and social sciences at ECLA of Bard College, Berlin’s Humboldt University and Duke University. 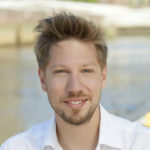 Florian regularly contributes to the public debate on new forms of learning and innovation and has been teaching the DO School method at a variety of universities including Columbia University, Oxford University, the University of Geneva, the Hasso Plattner Institute at Potsdam University and the European Business School. In 2015, he was named a Fellow by the Tribeca Disruptive Innovation Awards and is an Advisor to the American Friends of Bucerius.